Posted on September 29, 2015 at 7:28 am. 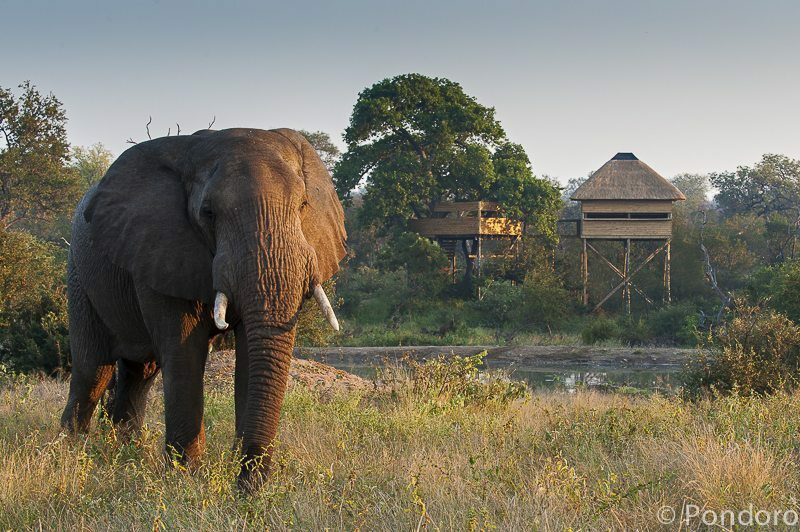 Our Treehouse hide is proving to be very popular with guests. Nothing beats the feeling of being on your own in the bush while listening to a symphony of nocturnal sounds. The hide has a solar powered spotlight for viewing any nocturnal animals visiting the waterhole that is situated close to the hide. Rul and his guests were slowly returning to the camp during the evening safari on the 24th of September 2015 when he stopped to view some impala. He then heard the unmistakable rasping sound of wood being sawed as a male leopard roared and advertised his presence not too far away. He raced in that general direction, found some fresh tracks and as he stopped upon smelling the fresh popcornlike scent of a male leopard scent marking, his tracker America spotted the elusive cat. Watsakile, the big territorial male, was slowly walking east towards Ngala dam. They followed him as he walked right past our Treehouse hide without even giving it a second glance.